There is no easy way to qualify how much some pf these characters mean to me. Samwise is a character that I easily identify with. Or, maybe a better way to say it, I want to identify with him. In him I see a lot of what I want to be. Sam was Frodo’s most loyal companion in Tolkien’s classic Lord of the Rings trilogy. He was there at the beginning of the story, by Frodo’s side, and he was in the same spot at the very end of the story. He wasn’t the smartest, or the strongest, or even the bravest. He was simply Samwise. Sam never wanted to be a hero or an adventurer. He was content to stay in the Shire and find a wife and start a family and just be a Hobbit. I take that back, he wasn’t just content to do that, he wanted that more than anything. In other words, he was just like most of us. Not craving the adventure or glory, just wanting to live a peaceful, quiet life. In this way, I can identify with Sam. I love my own little sphere, and I love my family, and the idea of stepping outside all of that is, frankly, terrifying. Samwise did step out of it, though. Because the one thing Sam is more than anything else is loyal. It was his loyalty to Frodo that led him away from the Shire and into the larger, frightening world. It was his loyalty that led him away from Rivendell and toward Mordor. His loyalty brought him back to Frodo after he had been so forcefully dismissed. Above all else, Sam was loyal. I often think Sam represents the amazing things normal people do under extraordinary circumstances. It makes sense. Tolkien served in the British military in World War I and wrote The Lord of the Rings during World War II. He was surrounded, for a good portion of his life, by normal, ordinary people doing incredible things during terrifying times. Sam was the hero he saw all around him everyday in his neighbors. 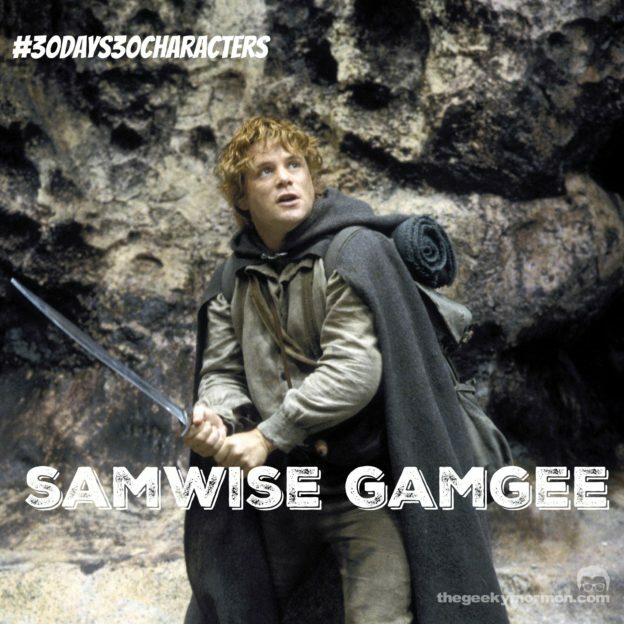 So, in The Lord of the Rings, Sam was not the strongest, the smartest or the bravest, but in his own quiet, unassuming way, Samwise Gamgee was the best. He was the best of all of us. The best we all hope to be. That’s why I love Sam.